Because of national health concerns about lead in drinking water, City departments and I took the unprecedented step to identify public drinking water sources and water systems, to test for lead, and to remediate problems identified in the last three months. Earlier this week, we released the following information to further update our residents about the City’s work in this endeavor. Below you will find comprehensive information on testing and remediation in our water system, schools, parks, and public buildings. We also announced a Lead Service Line Replacement Program, funded through MWRA no-interest loans, to identify potential lead service lines to residents’ homes and replace them. MWRA has made $100 million in interest-free loans available to member water communities to fully replace lead service lines. Newton is prepared to take advantage of this program. There are some lead service lines in Newton that go to individual residences, and these need to be replaced. We are announcing a program to accomplish this work. Service lines were allowed to be made of lead for many years. Newton’s Department of Public Works (DPW) has reviewed records from homes built prior to 1951 and has identified 641 homes for further inspection. If the City’s records indicate a possibility of a lead service line, the homeowners will receive a certified letter. The City has hired an engineering firm to come to these properties and determine the scope of work and cost required to replace the service line. This will be done at no charge to the homeowner who will need to give permission in advance for their line to be inspected. If a lead service line is identified, homeowners will be able to enroll in the MWRA home service line program. MWRA estimates that the average cost to fully replace a lead service line is typically between $3,000 and $5,000. The City will participate in a cost-sharing program with the homeowner. The details of this program will be finalized with the City Council. For questions about the lead service line replacement program, please email LSRP@newtonma.gov or call 617-796-1640. While replacing these service lines will eliminate the largest remaining source of lead in water and is our current priority, we are also working on identifying and replacing lead goosenecks, an approximately 18 inch flexible piping connecting mains to service lines in the streets, which were made of lead until roughly 1980. Within the next month, we will be identifying possible locations of these goosenecks, which is a very labor intensive process. Many, but not all, have been replaced in the course of cleaning and lining water pipes. As DPW works to identify and remove lead service lines, they will also be collecting data on where the goosenecks are. Other sources of lead could be present within homes. Lead solder was not banned until 1986, and some fixtures made of other materials such as copper or brass can contain some lead in the linings, especially in imported fixtures. The State’s Department of Environmental Protection’s (DEP) only testing requirements for municipalities testing drinking water is to test in 15 homes and 2 schools for lead and copper every year. There are no regulations or guidances for testing at public parks, public buildings, or in private or non-profit owned buildings. The City of Newton has followed the protocols to date, but in response to concern nationwide about lead in drinking water, the City began an unprecedented program in April to proactively conduct more advanced testing to determine potential sources of lead in the City’s water system. We have put together a document to summarize Newton’s response to concerns raised around the country about lead in drinking water. Much of the work is just beginning. Until lead in water became a national headline, very few municipalities were focused on it as an issue. As a result, the records that the City has on lead in the water source are not comprehensive. Moving forward, we are committed to making all testing results public and accessible and will document every location where testing has occurred and where remediation was required. Massachusetts Water Resources Authority (MWRA) provides all of Newton’s water from the Quabbin Reservoir and does extensive testing of the water coming into Newton every year, the results of which are mailed to each household once a year. In MWRA’s Drinking Water Test Results for 2015 report, published in June 2016, MWRA states that their water does not contain lead and that it is treated to reduce corrosivity, which helps to prevent leaching of lead from pipes or other materials into the water. The City’s water main pipes are not made of lead. Water comes from the mains to residences, other buildings, and outdoor fixtures such as bubblers in parks through service lines. These lines run from the mains directly to the building and are not shared by any other structure. While all of these programs are underway, we remind residents that when lead poisoning occurs, the most likely source is lead paint or lead dust from paint. Other sources include soil, some foods, some porcelain or pottery and some toys. Lead in water can add to overall exposure but is not considered to be a major source of lead poisoning. Children in MA receive blood tests for lead at the ages of 9-12 months, 2 years, 3 years, and 4 years (if the family is in a high-risk neighborhood). Newton does not have any neighborhoods deemed by the state to be at high-risk. All children are required to have at least one lead test before entering kindergarten. Young children and pregnant women are most at risk from lead exposure. Infants consuming formula prepared with tap water are at greatest risk. 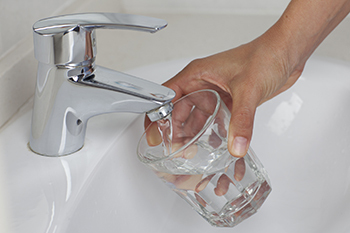 Running the tap until the water is cold, especially after the pipes have not been in use for six hours or more and using the cold water tap for drinking or cooking are good measures to reduce the risk of exposure to lead in water. If residents decide to have their home tap water tested for lead at their own expense, this testing should be performed in a certified laboratory. A list of these labs can be found on the MWRA website. While the state mandates yearly testing of two fixtures in two school buildings, the Mayor, in conjunction with DPW and the Public Buildings Department, decided in mid-April to proactively test two fountains in each of the City’s public schools for lead. This screening alerted us to an actionable lead level in one drinking fountain at Burr Elementary School; further testing revealed a more significant problem at this school. A remediation plan to bypass the existing plumbing in the school is underway, and the water will be tested for lead well before the start of school in September. None of the other schools tested high during this screening. We made the decision to go beyond the state program for testing in schools. At the end of June, the City hired Universal Environmental Consultants of Framingham to test all bubblers and sinks in nurses’ offices, staff rooms and kitchens in each of our public school buildings. Samples were taken from 283 fixtures; 17 (6 bubblers and 11 sinks) in 12 schools tested above the actionable level for lead. These fixtures will be replaced and retested. The City is committed to repeating this level of testing annually for the next two years. The results of this testing will inform what a future testing program looks like. Results of these tests and all other testing in 2016 have been posted online on the drinking water page of the City’s website. Future test results will be added to this spreadsheet. On May 17th, the City was notified that an external drinking fountain at Family Access of Newton was found to have elevated lead levels. This fountain was turned off immediately. After learning about this, DPW proactively tested 12 public drinking fountains in the City’s parks to determine whether further action needed to be taken on external fountains. One round of testing took place on June 10th and another round on June 28th. The results from the first round were received on June 23rd and showed that 4 of 9 fountains tested were above the actionable level. At this time, the four fountains were shut off immediately and bottled water was provided at two locations with high tests, Crystal Lake and Gath Pool. On June 29th, based on the high proportion of tested fountains with elevated lead levels from this screening round, the City decided to turn off external fountains at public parks while further remediation options are being discussed. The second round of results of three additional drinking fountains were received July 7th and showed no additional elevated lead levels. The City has identified 42 stand-alone fountains in our parks. Of these 42, 27 were in use prior to being shut off; the remaining 15 fountains were inactive, some for years. The City will use the same third party tester as used in the schools, Universal Environmental Consultants, to test all of these fountains within the next week. We will evaluate appropriate remediation plans once we receive these results. The City has received feedback from almost 400 residents through a survey and email and will take all input into consideration as we look to keep everyone safe and meet the expectations of our residents. The City will repeat testing of the outdoor fountains yearly for the next two years. There are 56 drinking fountains in 26 of our public buildings. On June 16th, Universal Environmental Consultants took samples from these fountains and submitted them for testing. We expect to receive results within the next two weeks. Appropriate remediation plans will be determined once we receive the results. The City will repeat the testing of all of these drinking fountains yearly for the next two years. The DEP regulations on water testing are minimal. As a City, we are committed to going above and beyond these regulations to ensure that the drinking water in Newton is safe. We will keep the public informed of all test results as they become available and of remediation plans as they are finalized. For further information, please go to the City’s website, newtonma.gov/drinkingwater. If you have any questions, please email us at:drinkingwater@newtonma.gov.